A lot of people walk up to me in the street and say "Peter, why are you so hard on Dwarfs and Dwarfs players? And I reply "They don't let me have an enjoyment phase, so why should I let them"". However in the interests of fair play, I asked local Dwarf and hobby-wrecker Tane Woodley to write a Guest Post on what he would do to improve the Dwarf Book. He's done that and I present it here for your edification. A big thanks to Tane for all his efforts. 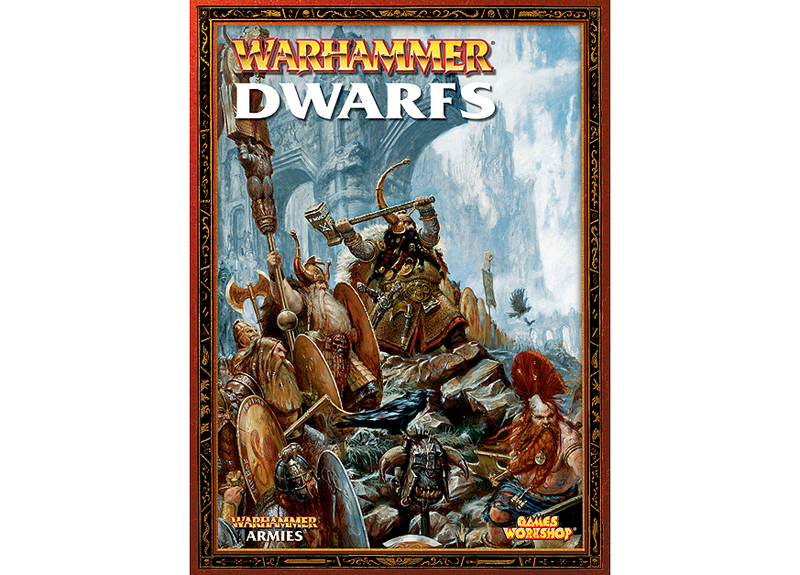 Pete asked me to write a guest post on what the 8th Edition Dwarf Army Book might look like. I can’t say what it might look like, as Christ knows what goes in the GW Design Studio sometimes (“Hmmm, yes the Troglodon is clearly worth 200 points, while that Ironblaster is only worth 170), but I can talk about what I’d like it to look like, so here goes. In summary, of the four phases in the game, Dwarves don’t participate in magic, have extremely poor movement and are mediocre in combat due to low initiative, lack of rerolls and limited attacks. Only in shooting do Dwarves excel, but even here the army design is poor. Dwarf missile troops cannot move and shoot, while the best Dwarf shooting is from war machines, which have to remain static. Because shooting can’t be directed into combat, a shooting-heavy army must have time and space to allow its firepower to affect the enemy. This means sitting still while the enemy move forward, hoping that shooting will kill and attrit key elements of the enemy army. Dwarf reliance on hundreds of points of squishy war machines also means that the other parts of the army have to form up around them. Otherwise a clever opponent will get hunters into the war machines, harvest the points and use their superior mobility (and everyone has superior mobility) to avoid combat for the win. The whole design of the army enforces a static approach on Dwarven players. The Anvil, Rangers, Miners, Gyrocopter and Strollaz rune do allow more movement, but often this puts mediocre Dwarf combat troops in range of the enemy even faster, without time for shooting to have an effect. I’ve had better results with my gunline than with my Ranger ambush list, simply because it is a stronger army. So, how do we improve Dwarves? The problem is how to do this within the bounds of current fluff, which is extremely limiting and the reason why Dwarves are in the situation they’re in. So no Level 4 Dwarf mages on Lore of Shadow, with ninja Dwarves on magic carpets. My thoughts are that the design has to shift from shooting supported by combat with no magic or real movement, to combat supported by shooting, some magic and improved movement. I think this can be done within the current fluff by emphasising Dwarven discipline, superior craftsmanship and rune magic. Movement can be improved by adding some new units. I think hunting hounds would fit within Dwarf fluff, as Dwarves are woefully lacking cheap chaff; raven swarms might also be workable. We can all be certain there’ll be some sort of Monstrous Infantry, either rune golems or steam battle-suits. M5+ Monstrous Infantry will give a boost to an M3 army. Gyrocopters dropping in points and becoming unit size 1+ will also help, by giving a fast mobile element. Some sort of steam/rune battle chariot with cannons for arms might also appear, again giving some speedier options. Most importantly though, I think Dwarves need to be able to manoeuvre better than anyone else at close range. I’m thinking marching after Swift Reforms, reforming as a charge reaction (like Sea Helms) and possibly, declaring charges after a swift reform; all dependant on a leadership test (possibly with modifiers). These three manoeuvres all imply disciplined, well drilled troops who move smoothly and like a well-oiled machine on the battlefield. Having spent hundreds of hours on parade grounds myself, I can say that movement in a formed body owes less to your leg size, and more to the practiced cohesion of a unit. This is something that Dwarves should excel at, the fluff always talks about their discipline and training. These new abilities might seem broken, but remember that this is only on M3 infantry. And if you want Dwarves to fight not shoot, they have to be able to compete in the most important part of the game, movement. It’ll make it harder to get flank charges on Dwarves, or to protect your own, but Dwarves are unlikely to outnumber their opponents, so these abilities present a new series of challenges that can still be met with better play. Opponents can still surround them, but once in close, superior Dwarf training and discipline will give them an advantage. The second phase, Magic, has traditionally been a no-go for Dwarves. I think this is a mistake, as it means that the ability to easily concentrate combat power provided by magic is sorely missing. I think a series of bound spells or runes that allow buffing and hexing should be added, to reduce the reliance on war machines to affect an enemy at range. These shouldn’t be at the Purple Sun level of awesome, rather at the signature spell level. 5+ ward saves for a turn, +1S or +1 A/S is all that’s needed to boost Dwarves in what is currently a forgotten phase. Shooting can also be refocused to support a combat approach, by making Dwarf shooters more mobile. Thunderers could be move-and-shoot again, giving more options to guard flanks and take the fight forward. One thing I’d like to see is a throwback to 3rd Edition; weapon teams. Mobile fire-throwers, rocket launchers, machine guns. These should be less effective than their Skaven equivalents, but more reliable and better protected, as would suit the fluff. Dwarves will still need shooting, even with my proposed changes, but these will allow it to be dynamic, responsive and mobile, unlike the cannons on the baseline of the table. If Dwarf War Machines could be better protected against hunters (e.g. entrenching, GW on crew etc), then this helps remove the incentive for combat units to nursemaid the artillery. Weapon teams if pointed properly should also lower the need for so many static war machines. Finally, Dwarves really need a boost in combat. Not in the ‘3A per model’ sense, or by increasing Strength across the board. Rather, I think Dwarves can look to use their superior craftsmanship. I think an army special rule providing all infantry with Armour Piercing and with either +1 A/S or a reduction in enemy armour modifiers is enough. Dwarves are meant to be the best smiths in the world, but currently their weapons and armour are equivalent to a Skaven’s or Goblin’s. Dwarves with S5/6 Great Weapons and either -3 or -4 to A/S will also have a nice effect on the meta with it’s prevalence of 1+ save cavalry. The armour modifier rule (S4 has no effect, S5 becomes -1 etc) doesn’t punish S3 troops (who have enough problems) but makes the scarier enemies easier to handle. Less damage received combined with more inflicted will make Dwarves better in combat, and more likely to actively take part in this phase. Dwarves should also have easier access to Hatred; they’re resentful bastards who can hold a grudge. Give Dwarf Lords the ability to take a Book of Grudges to provide unit hatred, or have this as an ability on Thanes and Lords. I don’t’ think army-wide Stubborn is a good idea, partly because we need less of this in the game, and partly because Stubborn is only good when you’re losing. Dwarves need to have a chance to win combat, which currently is not normally the case. Eternal Hatred for Greenskins, Skaven and probably Chaos Warriors is entirely fitting with the army background. None of these should come for free of course. Improvements in combat, movement and magic means that our shooting and anti-magic must be toned down. Say only 1 Spellbreaker per army, and make the war machines more expensive and/or turn runes like Forging and Accuracy into master runes (only 1 per army). Organ Guns may need to roll to hit. Points per model should increase. A Dwarf Warrior with Great Weapon currently costs 10 points. I think this is a point too much, so if this is true, the additional abilities I’ve cited (reform manoeuvres and craftsmanship) should push him up to 11-12 points per model. He’s WS4, S5 with -3 to A/S and T4 with a 5+ AS that only drops at S5 and above, so he looks pretty cheap for that, but he’s also ASL, M3 and easier to magic than he is at present. He might be underpointed, but he might not, and he’s certainly not Nurgle Beasts or Mournfang cheap. Dwarves should be expensive on a per-model basis, but they should be good to boot. In some ways this is a moot exercise. If Dwarves are due for release early next year, the army book is probably about to be or has already been printed. So this is about 12-18 months too late in that respect (sorry, Pete did ask me in January 2012…..). But when and if we get a new army book, I’m hoping that the direction taken is the one I’ve discussed here. The mechanisms I’ve described might not be used, but I do hope that GW refocus the army from shooting to combat supported by movement, magic and shooting, as this will lead to a more dynamic and fun army. And ultimately, it’s all about fun, both playing with and against. So let’s all hope that 2014 is the year that Dwarves put down their cannon rammers, pick up their axes and march forward to settle some grudges in person. Really well written and thought out Tane. A great read, and what you suggest is totally reasonable. Apart from the charging after swift reforming :). Would just giving Dwarfs movement 4 help at all? I read the Sigmar books, and in there the Dwarfs are the ultimate combat troops, so this should be represented in game. I don't think M4 goes that far to helping Dwarves, though it wouldn't hurt given how abysmal movement is. I think the real problem with Dwarf movement is (a) the lack of unit types, particularly the fast and chaff type ones, and (b) the medicore state of our combat troops, which means no incentive to actually move up and engage. Charge after swift reform is borderline broken I admit, so if it is considered, there'd have to be strong caveats on it. I think Ld tests at a penalty, only on M3 infantry and/or only if a Thane/Lord is in the unit might go some way to curbing what could be a powerful ability. Nice write up Tane very well though out. I think we'll see a lot of premade Runic items in any new book and less ability to craft particular combos. Personally I would like to see a (1) book with two lists (a) the standard dwarfs and (b) a slayer army so you can either or, (2) rangers to be a core choice not an upgrade and cheaper, (3) longbeards to be improved at present they're overpriced and not that great, (4) BSB to able to take a GW, (5) Slayers to be skirmishers or ranked troops - you choose which, (6) Gyros cheaper with bombs - I mean a Terradon can drop rocks but a highly sophisticated flying machine cant? ?, (7) something to boost protection against spells like Final Transmut, 13th and/or IF and (8) combat buffs perhaps Hammerers get ASF with GW. I can't really see units being allowed to spin and charge, but I do like the idea of the units getting armour piercing to represent their mastery of armour and weaponry. I can't say that a strength bonus across the board would feel wrong given how powerful your average Dwarf is in the stories, but I can see why they wouldn't go down that path. Thanks for sharing your suggestions. I don't know what they will do with the new book. I just wish they would hurry up and deliver it. Yeah, spinning and charging is probably going too far, both in terms of balance and also because GW is removing 'fancy charges' like this from the game. Still, as I don't see the basic army design changing from being infantry centric, Dwarves need something in the movement phase to help them compete with all other armies who have cavalry, monsters and higher movement for longer range charges. Fantastic right up Tane, everything looks really well done and thought out. However... forgot about Bear Cavarly my man :(. In the origninal incarnations of the rules a Dwarf in heavy armour was as fast as an elf or human in heavy armour. When they dropped movement penalties they forgot to upgrade dwarfs to match. I see nothing wrong with dwarfs having a magic lore (say lore of stone or lore of runes) and have access to metal magic and maybe life and fire. Many of the abilities Tane described could be achieved by access to these lores. Toughness 8 dwarfs would be pretty hard to wound, fire magix would deal with enemy chaff and lore of metal provides all sort of armour buffs and debuffs. Hopefully it's a new lore or a collection of runes/bound spells that give these effects. Simply creating Dwarf mages with access to Fire, Metal and Life would be lazy design on GW's part. Sorry Simon, I don't think Bear Cav is a goer. Only if the Golems that GW are likely to produce are Mutalith ugly, in which case the Scibor bear-riders might make acceptable proxies.